The Jamestown Community is grateful for the incredible fundraising support from so many individuals and groups! Fat Tire Flurry Fundraiser – More than 260 cyclists joined in this benefit ride up James Canyon from the Greenbriar to the Merc in December 2013. Proceeds went to the new Jamestown Community Foundation fund, which directly benefited individuals who were affected by the flood. This is the same group that raised money for the Rebuild Jamestown fund in October 2013. Next Door Fundraiser – Cyclists 4 Community hosted the Next Door fundraiser at the Kitchen Next Door on January 11th, 2014 to raise even more money for the residents of Jamestown, To date, Cyclists 4 Community has raised $120,000+ for Jamestown. Hug a cyclist next time you see one. About Cyclists 4 Community. 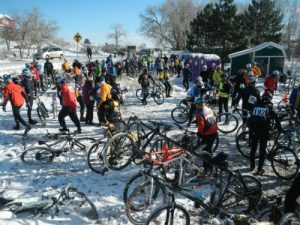 Cyclists 4 Community is a nonprofit, tax exempt, 501 (c)(3) charity organization, organized for the benefit of the citizens of Boulder County, Colorado. As cyclists, business people, and citizens, Cyclists 4 Community aims to build a stronger relationship with all users of the roads, trails, and bike ways. After the 2013 flood, cyclists in oulder County allied the business community to pull together resources to help those in need. The Cyclists 4 Community Event was put on in cooperation with the Boulder Cycling Club http://bouldercyclingclub.org/, and more than 50 volunteers from the Boulder cycling community. Special thanks go to Sandy Greathouse for raising $2,400+ for the Rebuild Jamestown fund through this fundraiser! Jamestown Juggernaut – Boulder Track Club – The Jamestown Juggernaut is a challenging Half Marathon Trail Race starting from the Mercantile Café (Merc) and running through the beautiful Cal-Wood and Balarat Outdoor Education centers (both private properties) above Jamestown and finishing at Elysian Park. The event features a “King of the Mountain” 2.5-mile hill race starting from the Merc and finishing at the top of Balarat, and a 1-mile family/kids run that will start at the Merc and finish at Elysian Park. The Jamestown Juggernaut is a promotion of health, fun and fitness with its primary aim to support long-term flood recovery efforts and to celebrate community-rebuilding initiatives following the devastating 2013 floods. This event was sponsored by the Boulder Track Club in October 2015, and will take place again this year in early October 2016. More info forthcoming. Preston Poe’s New Album to Benefit Jamestown – Musician/Artist Preston Poe is donating 100% of CD profits, Still Waters Run Deep to Flatirons Habitat for Humanity to assist residents in rebuilding. Songs were written from interviews. The CD is available at: CDBaby.com. More info forthcoming. Boulder Wine Merchant – Flood Wine & Silent Auction This heartwarming event brought in $3,600 for rebuild JT! Yummy wine for a great cause. Thanks to all involved! GP RED In an effort to support flood affected communities, GP RED, a non-profit group based in Louisville, performed a national call to action for donations. In total $1,200 was raised and will be divided between Lyons, Jamestown and Wildlands Restoration Volunteers. Teresa Pembrook will be presenting a check for $400 at the next Board Meeting. The funding will be applied toward the restoration of town square. Thank you GP RED! 4th of July – Raised ~$10,000 for Rebuild Jamestown! Please visit here to see a list of organizations who donated services or items to this stellar community event. Thank you Leesa Bolden for organizing! Boulder Little League – raised $250 for Jamestown on April 5th, 2014, Opening Day. Thank you Barbra Charron for coordinating! Refresh to Rebuild – Twig Salon in Boulder hosted a cut-a-thon and mini spa day and gave residents/staff a much needed pampering AND raised $7,000 toward Rebuild Jamestown!!! Special thanks to Jamie Nelson who works for the salon and originated and coordinated the event, to Courtenay Bedell for her amazing volunteer team coordination, and to Kristi Rutledge for her efforts in scheduling our residents for their beautification. The volunteer team who solicited donations and worked at the event included: Kristen B. (JT), Jen (JT), Neon, Anna, and Jill B. (JT). All of the stylists at Twig donated their services for this event and massage therapist Nicole and Acupuncturist Laurel also donated their services for Jamestown. Thank you also to Twig owners, Korrie Fidge, Heather Shine and Haley Brekken for opening up your business for all of us! Thanks to this incredible team, we are all feeling refreshed and ready to REBUILD!!!!! Nancy Edelstein raised $750 for Jamestown at the recent Colorado Dulcimer Festival by simply putting up a display of photos, information and a donation box. As Nancy puts it, “I’ve always been convinced that people really want to help and don’t always know how. But given the opportunity, they take it.” Great idea, Nancy! Jamestown Elementary (East) with Community Montessori – A special thanks to this industrious group of students and teachers who made and sold chocolate roses to family and friends. On March 3rd, they presented Mayor Tara with a check for $823.50 for Jamestown. Read the story from the Daily Camera here. Way to go, kids! Flood of Love – Raised $2,500! Hosted by Balarat Outdoor Education Center Delicious homemade Italian food by Chefs Garbo and Mark featuring blue grass music. An event at the gorgeous Sherman street convention center in downtown Denver to raise money for the residents of Jamestown Colorado. The event included an Italian buffet, exhibition cooking, silent auction, games and bluegrass music. Special thanks go to Juliette Bartsch, who has done 3 different fundraisers for the Rebuild Jamestown. One was at Shine, which raised nearly $400, and two at the library raising over $2,000. Thanks, Juliette! Juk’n and Jam’n for Jimtown – Held at the Skylark in Denver, this event raised $2,700 for Jamestown! A whole line-up of bands played, including: Ethyl; and the Regulars, Matt Skinner Band, The Atomic Drifters, The Deltasonics, Contraband, The Alcapones, & Halden Wofford and the Hi Beams. Thanks to all who participated! Alexis (Lexi) Williams, daughter of Mark & Colleen Williams, did an on-line fundraiser through giveforward.com to raise money for the Jamestown flood victims. Seventy-eight people donated a total of $8,917. Lexi grew up in Jamestown and moved to California to attend college and now resides in Napa, California. Thank you, Lexi! Jello Biafra – Activist, former singer/songwriter for 1970s punk band Dead Kennedys and spoken word artist sold off Dead Kennedys paraphrenalia to raise $$ for the Jamestown Community Fund on New Year’s Eve. “Veggie Ninja Showdown” Karate Competition – Thanks to Tony Aieta, son of Jennifer and Marco Aieta, who coordinated a karate competition with his sensei Alex Bernat at Vision Quest Martial Arts and raised over $1,100 on December 7th, 2013. Casa Alvarez – Raised $1400+ for Rebuild Jamestown through dinner and live music! Gilpin County 5th graders – These awesome kids went door-to-door to raise $500 for Rebuild Jamestown!